According to the dictionary, the word “and” connects — as in: along or together with; as well as; in addition to; besides; also; moreover. 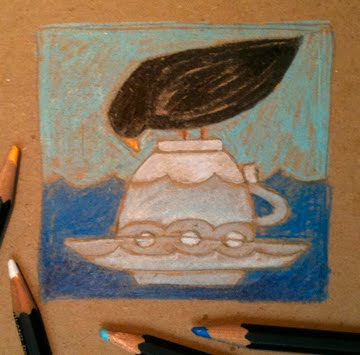 Tea connects too — as in: sip to sip; thought to thought; person to person. 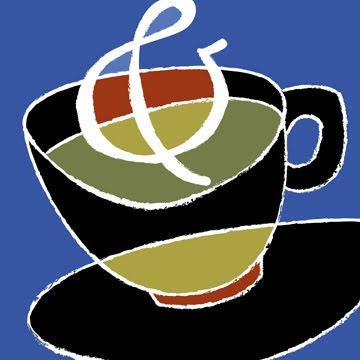 Today’s cup ponders the word “and” in the form of a steaming ampersand. So I suggest having a cup of tea, together or along with someone else, and in addition to conversation, besides connecting, you might also enjoy some company, moreover a pleasant interlude…and who knows what else. 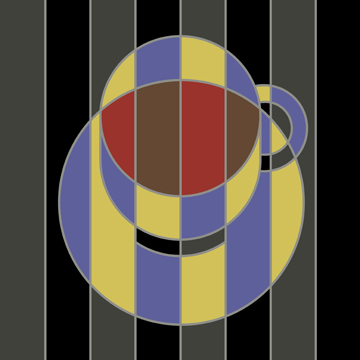 Today’s cup is a continuation of my geometric cup series. The color combination of purple and green is always a favorite of mine. 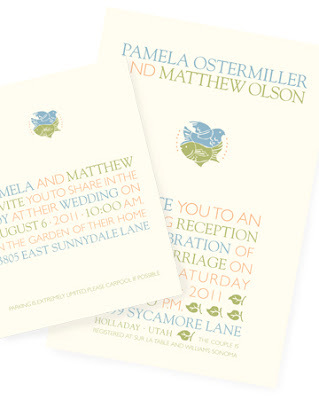 I recently designed a wedding invitation package for a dear friend and client. She said she envisioned a sort of yin yang symbol with a bird and fish since they enjoy the outdoors. A garden party celebration is in store. It was a delightful project to work on and they loved the outcome. I wish them the best tomorrow and always!